In 2008, after 17 happy years based in Caterham on the Hill and Woldingham, we decided it was time to move Figura’s HQ to somewhere closer to home. We found the perfect premises in The Old Bakery, Chiddingfold. Perfect not because we could move straight in, but because, with its vaulted ceilings and wonky walls, it offered us a great opportunity to showcase our design skills and our craftsmanship. One extensive internal renovation later, our new showroom was ready to open its doors. Chiddingfold is one of Surrey’s most beautiful villages. Equidistant from London and the south coast, it's proved to be an ideal location. Drop in and you’ll be given a warm welcome not only by the Figura team, but Mimi and Lula, the two family dogs. Go to many kitchen and interior design companies and you’ll probably find that the people you meet at the beginning are rarely to be found as the project progresses. Not so at Figura. Our core design team looks after every project – and we only take on as many projects as we can handle. If we suspect an extra project, however tempting, might compromise the time we believe every client deserves, we say no. Giles started Figura in 1991 because he was frustrated by the lack of creativity in the world of kitchen and interior design. He wanted to be part of a company where quality and attention to detail were everything, where nothing was pre-designed or off-the-shelf. As a great believer in designing by hand, he wanted to take clients on an organic journey and help them transform their homes with visually uplifting and functional spaces. When you visit our showroom in the picturesque village of Chiddingfold, you will see interiors that marry the brilliance of Giles’ vision with the very best in master craftsmanship. 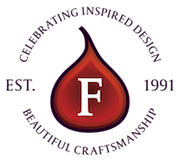 Our core design team has many skills, as do the expert trades and craftspeople we regularly call on to bring our clients’ visions to life. However, now and again, a project will require some very particular expertise and that is when we will open up our ‘Little Black Book’. It's a comprehensive directory of all the brilliant professionals we have worked with over the last 30 years. So, whether we’re trying to recreate some iron door latches, respond to a very particular lighting brief or add some unique touches to an interior, we’ll know just who to talk to.